Even though it says Longmorn-Glenlivet on the label, this is just a Longmorn. The name harkens back to a time when lots of distilleries in the Speyside would glom on to the Glenlivet distillery’s reputation and append its name to their bottles. The practice is no longer allowed, so you might think of this as a throwback label. Scott’s Selection is an independent bottler that used to be more ubiquitous in the US a decade or so ago–I’ve not seen very many recent bottlings from them in American stores. Their reputation is up and down, but the five Longmorn-Glenlivets they released in the US in the early-mid 2000s are all excellent–at least the four I have sampled are, and the odds are on the side of the fifth. Much like old Caperdonichs from this general era, these old Longmorns can be intensely fruity, in particular, intensely tropically fruity and the one I am trying tonight is no exception. This is the 1968-2003 bottling. 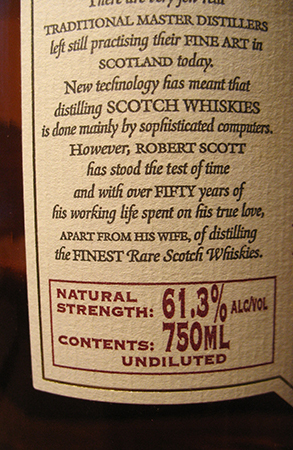 Scott’s labels are rarely free with cask details, and so it is not clear what kind of cask this was–I’ve seen references to it being ex-bourbon and have read/heard others who seem convinced that all of these were from refill sherry casks. I have come around in recent months to the line of thought that says that the prior contents of a cask (especially at this age) are not as relevant as the type of wood, and I am quite confident that this is from an American oak cask (by law American oak has to be used to make bourbon barrels but it is also used to make a lot of sherry butts). There is also no specific distillation or bottling date, so this is either 34 or 35 years old. I’ve had it many times before and love it–this review is to force myself to actually record some notes for when I no longer have any of it around. It is, alas, gone from all the places you’d expect to find it, but Scott’s Selection bottles back in the day went far and wide and it is not unlikely that you might come across it in a store off the beaten path. Nose: Very closed at first, as is not surprising with a whisky at such high strength. But with time notes of polished wood begin to peep through the alcohol haze. Some wood spice as well, and something fruity lurking in the back as well. Menthol; pine. With time and air the nose begins to open up, and the fruit in particular comes to the front: dried peaches with crystallized sugar, then some mango, maybe even a hint of candied ginger. After a while the fruit is placed on planks of cedar. With a touch of water the nose gets brighter: more pine, some citrus, maybe a hint of camphor. Palate: White pepper, some wood and then this very tightly coiled tropical fruitiness–papaya, mango, pineapple; some tinned peaches too. With time some pine resin as well and the fruit gets a little more expressive and a little more sour. But the flavours remain very compressed and even after 30 minutes of airing it’s too hot at full strength. But water makes this whisky sing, yes, it does: not really any new flavours at first (maybe some lime), but the fruit stretches out. After a couple of minutes a leathery astringence develops which forms a lovely counterpoint to the fruit. Finish: Long. All those tropical fruits with some slight woody astringence and then a little bit of salt. Water lengthens the finish and emphasizes the tropical fruit which remains dotted with salt crystals. Just the faintest hint of smoke around the edges. Comments: This is as good an advertisement for old whisky at a (relatively) affordable price as I can imagine. It’s very much in line with other old Scott’s Selection Longmorns that I’ve had: more tropical fruit and less pine than in the 1967-2004 (52.2%), and not as over the top in its fruitiness as the 1971-2004 (53.5%). Just a notch below a fantastic Gordon & Macphail 1971-2011 at 40% and a SMWS 1968-2007 at 52.5% that I was lucky to taste at a gathering in St. Paul in February that I think I’ve mentioned once before (a small group of whisky geeks, all of whom brought one high quality sherried whisky). At 61.3% it needs water to display its true qualities, and it is one to drink and savour slowly: this is as elegant as it is directly pleasurable. 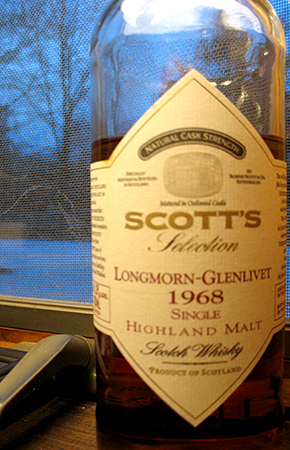 This entry was posted in -Whisky by Rating, 90-94 points, Longmorn, Scott's Selection, Whisky by Bottler. Bookmark the permalink. I think I prefer “fruit party at an old bowling alley” to my detailed notes. Yeah, on the one hand, the fact that the single malt culture in the US is nowhere as mature as in Europe means we don’t get a lot of interesting stuff here; but, on the other, it also means a lot of old treasures like this one hang around for a long time at reasonable prices–which is really a boon for people like me who are relatively new to the scene: when this was originally released I was not very much more than a casual drinker of single malt whisky. These Scott’s Longmorns, where available, are going for crazy money in the EU and UK–TWE is asking for £499 for the 1971-2004. I got mine for $160 just over a year ago. Approaching the end of this bottle, and after being open for 3.5 years this bottle may be at peak magnificence. It no longer needs water to open up fully: just 20-30 minutes sitting in an open glass. I am so very glad I found another before they all disappeared/rose sharply in asking price. Man, old Longmorns from this era are hard to beat. Words to be written in stone. In fact, the whisky boom has driven all of these amazing older whiskies into the collections of millionaires. They may surface again some day. We will just have to be happy with our stocks. I’m gonna open another one for birthday in January. Can’t wait! !